You are here » frostvalley.org » Overnight Camp » Mid-trip Update for our Adventure Trips! Mid-trip Update for our Adventure Trips! Hello! We wanted to give you all an update on the adventures happening with our 4 two-week trips this session. They are all going really well, and we have had consistent check-ins from all of them. Our trip leaders made sure to manage the heat and be extra conscientious of hydration during their first week. 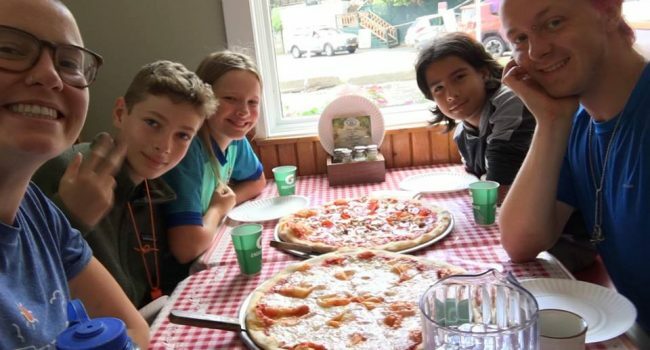 Many of our trips are transitioning into a different activity today, and we have a great photo of our Adirondack Hike and Climb trip grabbing a bite to eat, fresh from the trail, on their way to their rock climbing site! Our Maine Coast campers are starting their first day of kayaking today, after a rest day yesterday and the group has been bonding over making friendship bracelets. Our Long Trail hikers summited Camel’s Hump–one of my all time favorite mountains–on Friday and are having a more low-key 6 mile day today. The White Mountains trip is also starting their first day of climbing today, after a rest day yesterday. All of them will be making their way back to us on Tuesday afternoon or Wednesday morning, and we’re so excited to welcome them home!